This version of GitHub Enterprise was discontinued on March 1, 2018. No patch releases will be made, even for critical security issues. For better performance, improved security, and new features, upgrade to the latest version of GitHub Enterprise. For help with the upgrade, contact GitHub Enterprise support. SAML is an XML-based standard for authentication and authorization. GitHub Enterprise can act as a service provider (SP) with your internal SAML identity provider (IdP). GitHub Enterprise usernames can only contain alphanumeric characters and dashes (-). GitHub Enterprise will normalize any non-alphanumeric character in your account's username into a dash. For example, a username of gregory.st.john will be normalized to gregory-st-john. Note that normalized usernames also can't start or end with a dash. They also can't contain two consecutive dashes. Usernames created from email addresses are created from the normalized characters that precede the @ character. If multiple accounts are normalized into the same GitHub Enterprise username, only the first user account is created. Subsequent users with the same username won't be able to sign in. Ms.Bubbles ms-bubbles This username is created successfully. !Ms.Bubbles -ms-bubbles This username is not created, because it starts with a dash. Ms.Bubbles! ms-bubbles- This username is not created, because it ends with a dash. Ms! !Bubbles ms--bubbles This username is not created, because it contains two consecutive dashes. Ms!Bubbles ms-bubbles This username is not created. Although the normalized username is valid, it already exists. Ms.Bubbles@example.com ms-bubbles This username is not created. Although the normalized username is valid, it already exists. When using SAML or CAS, two-factor authentication is not supported or managed on the GitHub Enterprise appliance, but may be supported by the external authentication provider. Two-factor authentication enforcement on organizations is not available. For more information about enforcing two-factor authentication on organizations, see "Requiring two-factor authentication in your organization." your GitHub Enterprise instance's service provider metadata is available at http(s)://[hostname]/saml/metadata. To configure your identity provider manually, the Assertion Consumer Service (ACS) URL is http(s)://[hostname]/saml/consume. It uses the urn:oasis:names:tc:SAML:2.0:bindings:HTTP-POST binding. These attributes are available. You can change the attribute names in the management console, with the exception of the administrator attribute. NameID Required The GitHub Enterprise username. It may only contain alphanumeric characters or dashes, and cannot begin with a dash. The name identity format is urn:oasis:names:tc:SAML:2.0:nameid-format:persistent. administrator Optional When the value is 'true', the user will automatically be promoted as an administrator. Any other value or a non-existent value will demote the user to a normal user account. full_name Optional The name of the user displayed on their profile page. Users may change their names after provisioning. emails Optional The email addresses for the user. More than one can be specified. public_keys Optional The public SSH keys for the user. More than one can be specified. gpg_keys Optional The GPG keys for the user. More than one can be specified. 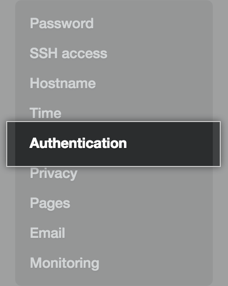 In the left sidebar, click Authentication. If you want to enable unsolicited response SSO, select IdP initiated SSO. Note: We recommend keeping this value unselected. You should enable this feature only in the rare instance that your SAML implementation does not support service provider initiated SSO. 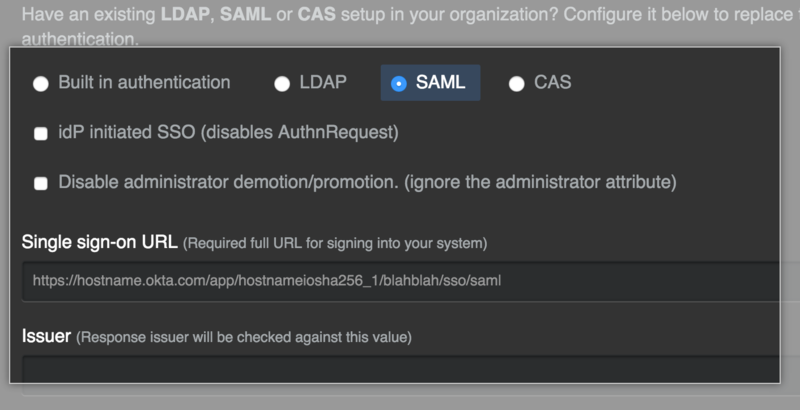 Select Disable administrator demotion/promotion if you do not want your SAML provider to determine administrator rights for users on your GitHub Enterprise instance. In the Single sign-on URL field, type the HTTP or HTTPS endpoint on your IdP for single sign-on requests. This value is provided by your IdP configuration. If the host is only available from your internal network, you may need to configure your GitHub Enterprise instance to use internal nameservers. Optionally, in the Issuer field, type your SAML issuer's name. This verifies the authenticity of messages sent to your GitHub Enterprise instance. In the Signature Method and Digest Method drop-downs, choose the hashing algorithm used by your SAML issuer to verify the integrity of the requests from your GitHub Enterprise instance. Under Verification certificate, click Choose File and choose a certificate to validate SAML responses from the IdP. Modify the SAML attribute names to match your IdP if needed, or accept the default names. If you remove a user from your identity provider, you must also manually suspend them. Otherwise, they'll continue to be able to authenticate using access tokens or SSH keys. For more information, see "Suspending and unsuspending users". The <Destination> element must be provided on the root response document and match the ACS URL. If an <Audience> element is provided as part of the <AudienceRestriction> element, it will be checked against the GitHub Enterprise Entity Id. This is currently the URL to the GitHub Enterprise instance, such as https://ghe.corp.example.com. Each assertion in the response must be protected by a digital signature. This can be accomplished by signing each individual <Assertion> element or by signing the <Response> element. Recipient in the SAML response was not valid. Recipient in the SAML response must not be blank. SAML Response is not signed or has been modified.